Map showing land grants in the Republic of Texas in the year of its founding. This is a rare William Kemble map depicting Texas in 1836, shortly after the Convention of 1836 where Texas declared its independence from Mexico and established the Republic of Texas. The map identifies numerous early colonization grants as well as varies new settlements and towns. Cartographically the map is derived from the Thomas Gamaliel Bradford map of 1835, which itself is derived from the Stephen F. Austin map of 1830 – the only reasonably accurate map of this region at the time. Like the Bradford map, much attention is dedicated to the newly established colonization grants and Mexican empresario grants, including John Cameron's Grant, Felisola's Grant, Burnet's Grant, Beale's Grant, Beale and Grant's Grant, McMullins and McGloine's Grant, De Leon's Grant, Power's Grant, Vhelin's Grant, Zavalla's Grant, Dewitt's Grant, Austin and Williams Grant, and Stephen H. Austin's Grant, among others. 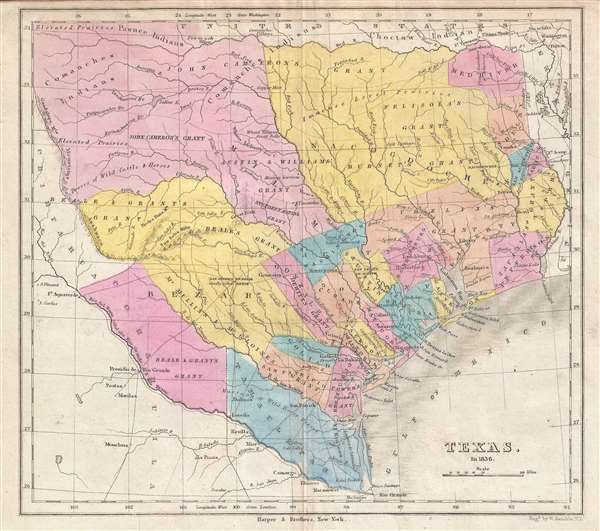 Unlike the Bradford map, which was issued before the creation of the Republic of Texas, this map extends the southern boundary of Texas as far as the Rio Grand to accommodate Beale and Grant's Grant as well northern Tamaulipas. It also recognizes the 1819 boundary with Arkansas, but deviates from the Bradford in extending the boundary directly north from the Sabine River as far as the Red River rather than turning west at 33 N latitude to continue north again at the the 18th parallel. This map was published for volume II of John Monette's 1846 book, The History of the Discovery and Settlement of the Valley of the Mississippi. It was engraved by William Kemble and published in lithograph by Harper and Brothers of New York. It is a highly desirable and rarely seen map, one of the few specific maps of the Republic of Texas to have been published during the independent period. William Kemble (1813 - c. 1870) was a New York City based merchant and engraver active in the middle part of the 19th century. Kemble immigrated with his wife Sarah from England to the United States on December 31, 1843 on board the ship Passmoz. He settled in New York where he established himself as an artist, merchant, publisher, inventor, and engraver. Kemble was on the 1839 management committee of the American Art Union, a now defunct organization focused on promoting subscription based sales of American art. He was also a founding member of the Century Club, an arts club that included John G. Chapman, a well-known painter, among others. Kemble is buried in Cyprus Hills Cemetery. Very good. Light wear on original centerfold.